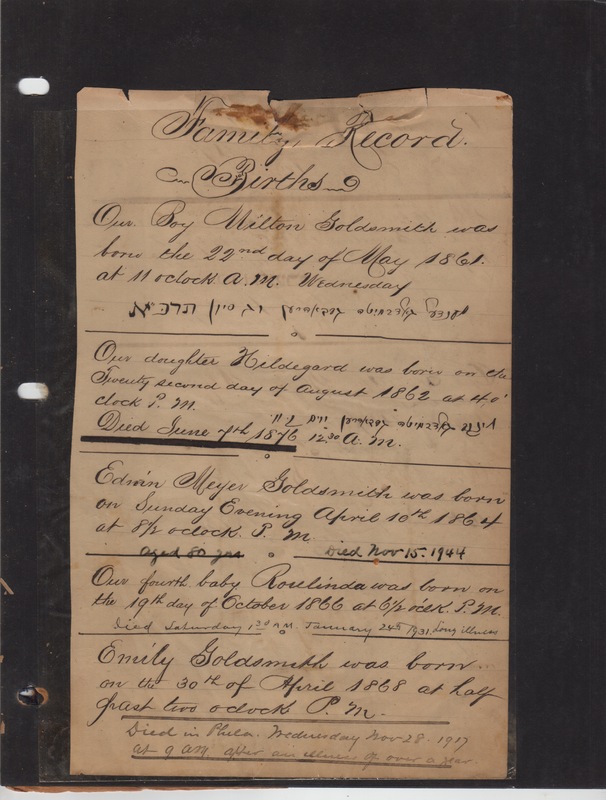 This entry was posted in Goldschmidt/Goldsmith, Milton Goldsmith's Family Album, Philadelphia and tagged Goldsmith, Milton Goldsmith, Philadelphia by Amy. Bookmark the permalink. Amy. Now knowing that her English name began with an H, it could be that the first letter if her Hebrew name is Het. I still don’t see a recognized name. But someone else might. It must be very hard to read because even those who seem to be able to decipher everything couldn’t do it. I can make out some letters, but I cannot think of any Hebrew or Yiddish name with the letters. But it might be an older name that someone knows. Or Abraham spelled it wrong, whatever it was supposed to be. His mother was Hinka, and Hilda was named for her. But I don’t know if Hinka was a Yiddish or Hebrew name either. It us definitely not Hinka. You truly have an amazing sense of perception, Amy. Where other people, myself included, would overlook seemingly trivial details, you zero in on them and explain their importance. You noticed for example the use of ‘our’ on Abraham’s fourth child and the beautiful variant of Rosa’s name. By the way, Rosalinda in Spanish means beautiful rose. As always your post was an interesting read, Amy. Actually I take that back. I can now see that. The problem was the third letter. But when you said Hinka. The third letter could be a nun and the fourth letter a couff that he made big that connects with the nun. The final letter looks like an ayin. Usually should end with a hey. But really could be a phonetic spelling of Hinka. That’s what I saw—the nun and the kaf, but the letters before those I couldn’t decipher at all. Thanks, Ellen! Boy, those entries are hard to read – even the English. Glad you were able to catch all of the details. what a lovely keepsake…great post! Thank you! It is a treasure. In noting the times of their births, Abraham showed how he cherished his children. I think there would have been a second page detailing the birth of Estelle and younger children as he was diligent with his record keeping. I agree, Shirley, that he would have continued to keep a record—unless after all those children he was just too overwhelmed! When I saw your comment about Estella and the younger children not being listed I went back to the album and discovered that that page could be removed and there was more on the back! Look for an email. Good questions! Your guess that he might show his assimilation progress by his change in using Hebrew (first it’s clear, then not, then non-existent) is fascinating to me. What a cool reading of what you found. So Abraham did all that writing and even thought to write down the times of the births. What a good and proud dad. Thanks, Luanne. This family has been one of my favorites—all the children of Abraham did such interesting things. So it’s been so much fun to see these new documents and learn new things. I’m a bit late reading this and couldn’t wait to give my two cents worth. But I always read the comments first. I was thinking it might have been continued on the back of the page, as Sue confirmed. I was glad to read she has also sent you a scan of it. Until next week – for the continuation of this series. I must admit I rarely read the comments, usually because I am an early commenter. I am glad you did and really glad Sue went back and checked for the back of the page! I don’t come back later when I’m early but I do like to read the interesting comments from your readers when they are quicker than I am. I was worried the page might have been pasted into the album and wouldn’t be easily removed. I thought that was a possibility also. For example, Sue could tell that the love letter I posted a few weeks ago had writing on the back, but she rightfully was reluctant to remove it from the album to check the back. So I didn’t even think to ask her about the reverse of this one for the same reason—I didn’t want her to risk damaging the paper. You’re right: it is very beautiful, florid script. What a treasure to have scanned and recorded for posterity. And the times of birth, too! It truly is—thank you, Michael! Always a treat to follow your families story!